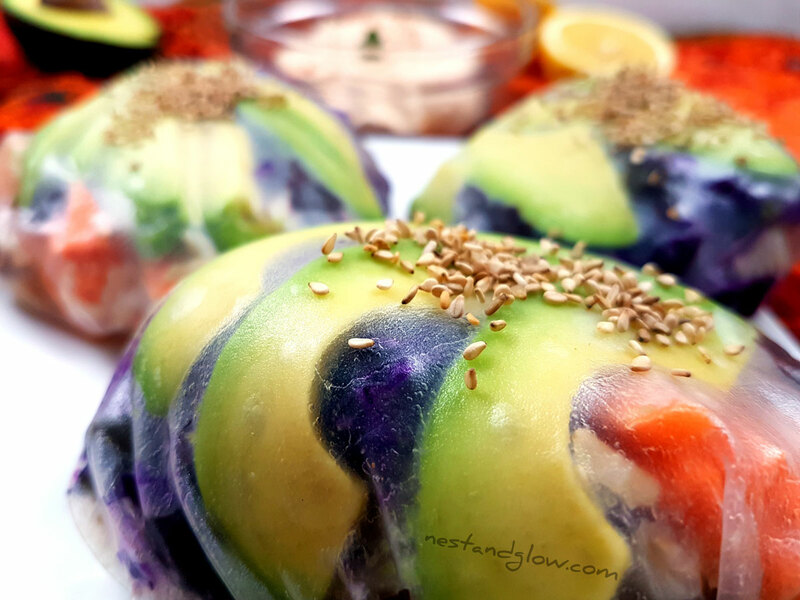 These easy to make sushi spring roll buns are a mixture of summer rolls and sushi with seasoned brown rice and seaweed. 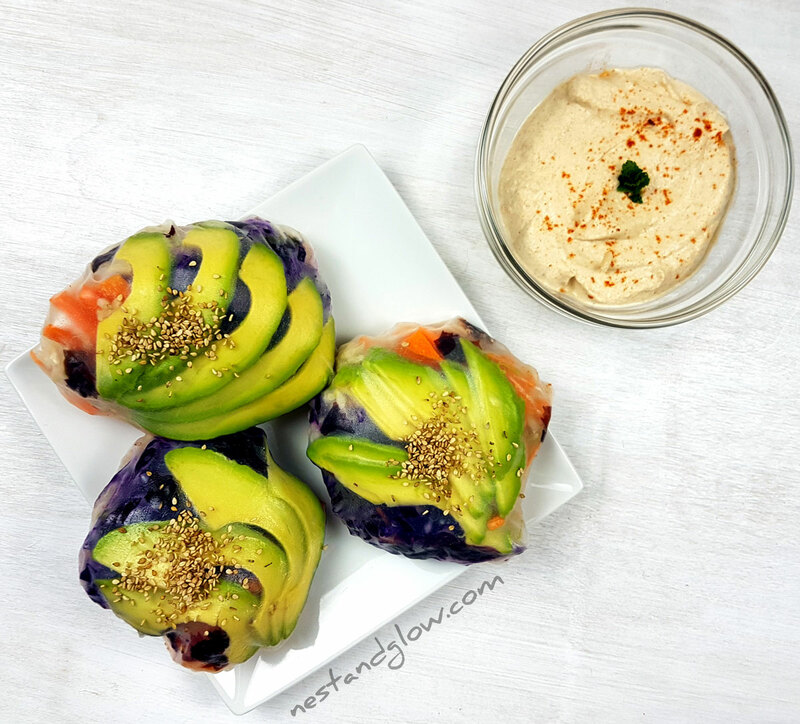 They look very tempting with a fan of avocado, orange carrots, red cabbage with a spicy and zesty raw almond dip. Perfect as a side dish or a main meal as they are loaded with vegetables, complex carbohydrates and heart healthy fats from the almonds/avocado. Suitable for plant-based, gluten-free, vegan and general healthy diets. Unlike sushi these are very easy to roll almost perfectly. In the video I actually used the shot of the first one to be rolled and that doesn’t happen often. This may get some dislikes on social media for using the name sushi, but it’s the same rice as sushi and contains seaweed so this seemed like a logical name to call it. If you’re following a raw food diet you can make these raw by replacing the rice with grated raw parsnip and raw coconut wrap. Soak the almonds in water, for at least 15 mins – overnight is best. Cook the brown rice, then set aside for 10 mins to cool. Mix all of the seasoned rice ingredients together, use a plastic spoon to prevent the rice breaking up. Slice and prep all the filling ingredients. 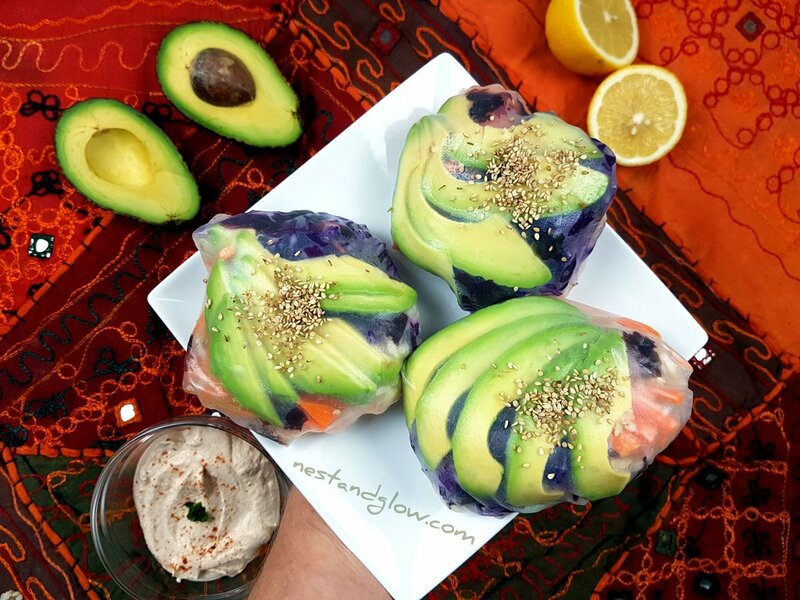 Soak a sheet of rice paper in warm water for a few seconds, then fan out 5 or so slices of avocado in the middle top with vegetables, seaweed and rice. Fold the rice paper to the top and going around in a circle fold about every 1/8th. Pinch the rice paper together at the top and then lay down fold side down. See the video for a demo. Drain the almonds then place with all the other dip ingredients and blend until smooth. Add as little water as possible. Ready to eat straight away but will last a few days in the fridge. I would recommend soaking your almonds for this, at least for an hour. Soaking will make them easier to blend and is said to start them sprouting and make it easier for your body to digest. It certainly feels like you’re doing the right thing as you drain off the brown soaking water. If you prefer you can replace the almonds with peanut butter. I use apple cider vinegar in this because I didn’t have any rice vinegar and it has a similar mild sweet taste. Some would say this is sacrilege not use rice vinegar in sushi, but for me it tasted great. Lots of the rice vinegar I’ve seen has preservatives and other nasties that I avoid. Apple cider vinegar is a great substitute for rice vinegar as it smells like rice vinegar and only has a tiny apple flavour that won’t overpower. White wine vinegar and balsamic vinegar has a very strong flavour that will overpower. You can use any seaweed you like in the middle I’m just using a mixture of nori and sea lettuce. Just some Shredded up sheets of nori or nori flakes would also work great. This recipe uses long grain brown rice because it’s healthier and I think it has a much better bite and texture. Use white rice or sushi rice if you prefer.